A couple months ago I started making our bread. I’m just tired of paying $4.00 for mooshy bread. Unless I’m at Trader Joe’s, then I take a few days off from baking and buy a loaf. Anyways…I started playing around with recipes around Christmas time. I usually make 2 loaves at a time, 1 for sandwiches and 1 cinnamon raisin. In a large bowl, dissolve yeast and sugar in warm water. Stir in lard, salt, oats, flax meal and two cups of the flour, starting with the wheat flour. Stir in the remaining flour, 1/2 cup at a time, stirring well after each addition. When the dough has pulled together, turn it out onto a lightly floured surface and knead until smooth and elastic, about 8 minutes. Lightly oil a large bowl, place the dough in the bowl and turn to coat with oil. Cover with plastic wrap and a clean dishcloth and let rise in a warm place until doubled in volume, about 1 hour. 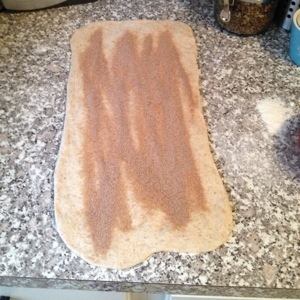 Deflate the dough and turn it out onto a lightly floured surface. 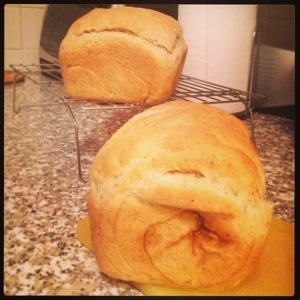 Divide the dough into two equal pieces and form into loaves. Place the loaves into two lightly greased 9×5 inch loaf pans. Cover the loaves with plastic wrap and a dishcloth and let rise until doubled in volume, about 40 minutes. Yes, I do use lard… Mom brought some to us, so I use it in the bread. But you could use any shortening or butter of choice. We also make one loaf into cinnamon raisin bread. 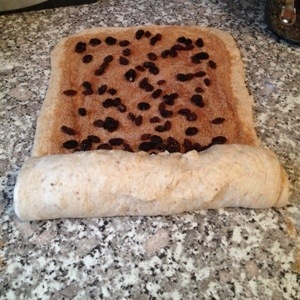 After dividing dough into 2 parts and before forming loaves, roll dough for 1 loaf out. Roll it so it is about 9 inches wide and 1/2 inch thick…it will be about 20 inches long or so. Sprinkle 1/4 cup sugar and 1-2 Tbs of cinnamon ( depending on how much cinnamon you like), then sprinkle with about a 1/3 cup of raisins. With having a toddler in the house we always have those little boxes of raisins in the pantry. This is a great way to use up the box that got partially eaten, then dried out. The raisins will plump up great while baking. Roll up and shape into loaf. Put loaf into greased pan and allow to rise for about 40 minutes. Bake as directed above. 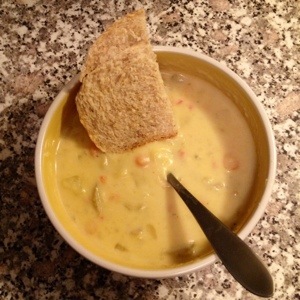 Is there much better than a bowl of potato soup and a slice of fresh bread on a cold winter evening?